The Geonetric VitalSite provider data automatically integrates with the new FInd-A-Doctor data widget inside of the Arreya Digital Signage Suite. It allows existing healthcare industry users of Geonetric VitalSite CMS software to create an interactive way for their visitors and patients to find more information about healthcare providers. As hospital campuses grow and add remote clinics, the ability for patients to find the doctor specialty quickly becomes more important. Many providers send maps and directions prior to a visit, which is costly. Once the patient arrives at the location, there is usually an information desk with costly hospital employees to direct patients to their appointment. The Find-A-Doctor digital wayfinding can eliminate the need for employees or queue lines and allow patients to arrive for appointments on time. This elevates a patients hospital experience. Patient satisfaction surveys are also tied to funding from Federal Government and other outside sources. An uptick in satisfaction means more donation money for each facility. The widget automatically generates the pages of content in a suitable format for large format touch screen digital signage. It can update data automatically or whenever the signage administrator chooses. The widget functions just like other widget in Arreya, that way you can mix this widget with any of the widgets or content creation tools that come with Arreya subscriptions. 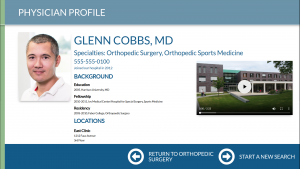 The widget automatically pulls data from your Geonetric VitalSite CMS, and generates pages of content for provider specialties and provider information. Updates to the provider data can be handled automatically by the widget. The widget automatically creates the columns, pages and formats the data into an easily read format. No manual data entry or configuration is required! The Find-A-Doctor widget first generates a list of specialties by looking at all of the physicians specialties listed in the doctor profiles. 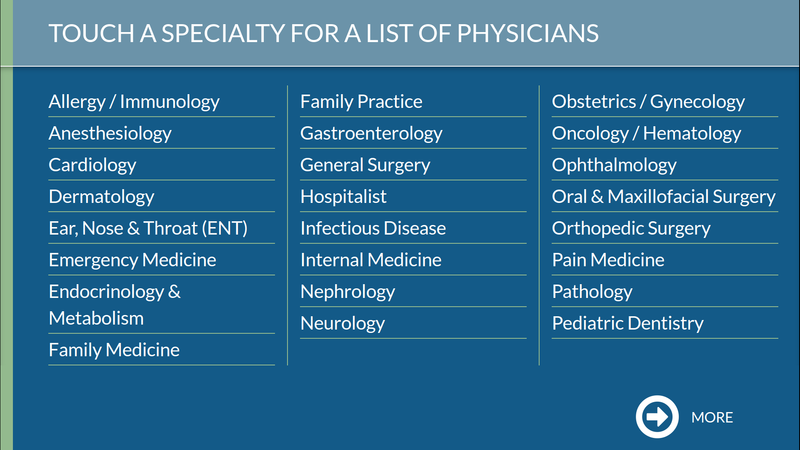 This list of specialties is automatically generated and will add and remove specialties when physicians are added and removed. Colors, fonts and sizing can all be customized to align with your existing branding. Making your Arreya Find-A-Doctor wayfinding custom to your hospital and clinics. Add home pages with videos or slideshows that play when no one is using the device. Clicking a specialty on the widget home menu will list out physicians for that specialty. This menu will automatically generate the rows and columns depending on how many physicians are in the category. 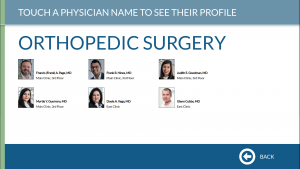 The physician’s photo, name, and location will be listed for users to click on to get more information. 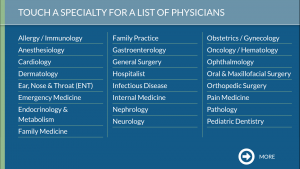 Clicking on a physician will navigate to the physicians detailed information page. 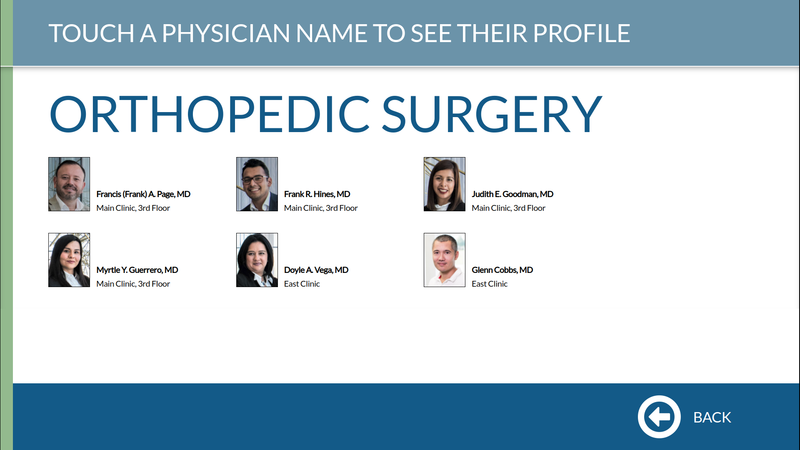 Here, information will be automatically populated from the physicians profile. 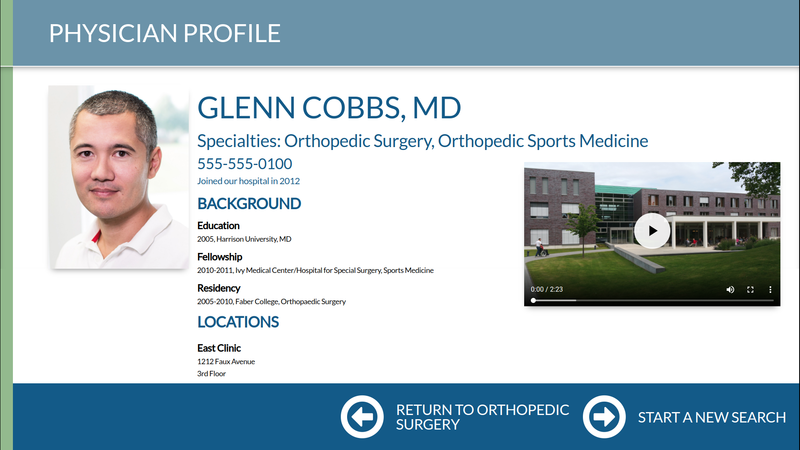 This physicians profile page will bring over location information, phone numbers, background information and more. YouTube videos linked to the physicians profile can also be displayed on this page. Directions can be animated through a building using flat or three dimensional floor plans. Information can be integrated for smartphones using Beacon technology or Internet-of-things. This allows hospital patients and visitors to take the directions with them as they navigate through the campus. The Find-a-Doctor widget is a great addition to any hospital or clinic looking to expand their existing Geonetric VitalSite service. Pairing the Find-a-Doctor widget with Arreya gives you a plug and play, low maintenance way to give patients and visitors an easy way to find more information about physicians at the hospital without costly mailing and extra employees. It also makes for more favorable surveys keeping necessary outside funding available to hospital facilities.